The grouper is related with the cod, and it has a white, delicious meat. It is therefore no surprise that the grouper is important for the fishing industry in Maldives. Groupers feed on invertebrates and fishes. They are most active at dusk. At daytime are they close to caves or overhangs where can hide if divers get too close. A specie often seen by snorkelers is the Honeycomb Grouper, as it is common in shallow waters where it often hides between finger-corals. This is a small specie (25-30 cm). The largest groupers can reach more than a meter in length. The catching method is rather unusual: The fishers are snorkeling, and when they see a grouper they want to catch, they lower a bait in front of the fish. The captured fish is kept alive in a basket and later given a hibernating drug before sent by air freight to restaurants in Hong Kong and other major cities. 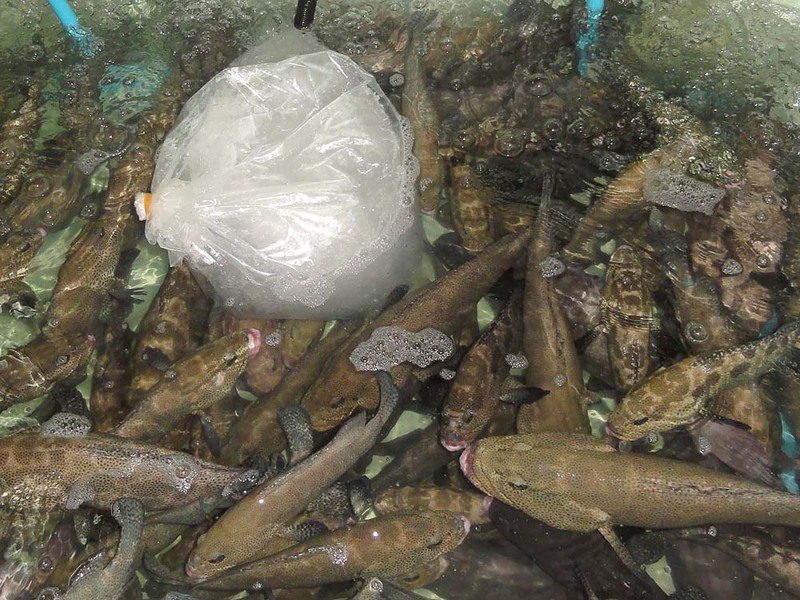 Groupers are given a hibernating drug in a water tank. The water is cooled with ice in plastic bags. The fish is then shipped by air freight.